I suppose the best advertising you could get for your business is having it featured in a movie. 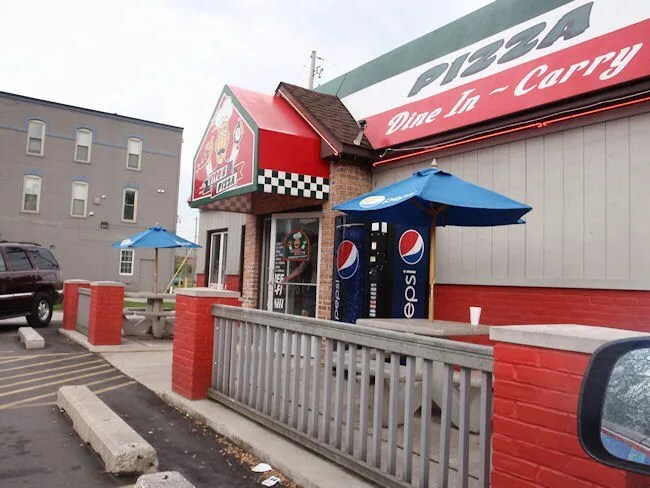 Vito’s Pizza on Grand Rapids’ west side was a big part of the movie 30 Minutes or Less which starred Jesse Eisenberg, Nick Swardson, Danny McBride, and Aziz Ansari. The production company came in to Grand Rapids and turned Vito’s Pizza to Hollywood set. When they were finished, they offered to restore everything back to the way it was when they came in, but the owners decided to ride the publicity and keep the look designed for the movie. Without the movie, I probably wouldn’t have given Vito’s a chance. It’s on Fulton Street a few blocks east of the John Ball Zoo. They have a very small parking lot right in front of the building and options for street parking just a short distance away. I assumed I was going to have to call in my order, but when I went to their website, I found online ordering. My favorite. I was just in the mood for a pizza and they were running a special on a two topping 16″ and it was something I could easily order online. I really like how they put their specials right up front on the online ordering section. 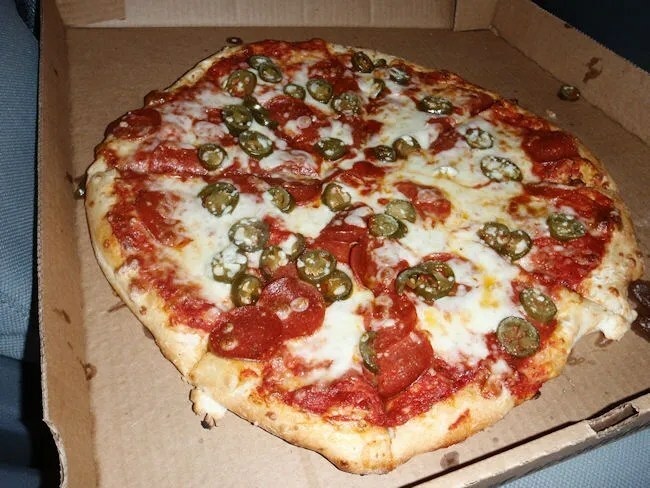 I ordered myself that two topping pizza with pepperoni and jalapenos. It was only 5:00 when I ordered, but I couldn’t get away from work until closer to 6:30, so I set it up to be ready then. When I walked in the door, I was met by the cashier who asked if I had already ordered. I said I had a pickup and she went to the kitchen to check. She came back out to say it was just about to come out of the oven so it would be a few minutes. I grabbed a seat in the dining room and took advantage of their free wi-fi while I was waiting. I walked back in to work with a large pizza box and it immediately grabbed everyone’s attention. I thought I was going to have to fight them off until I opened the box and they saw the jalapenos. Good move on my part. The pizza turned out to be pretty good. I thought I had ordered a thin crust, but the pizza was more of a typical thicker crust. 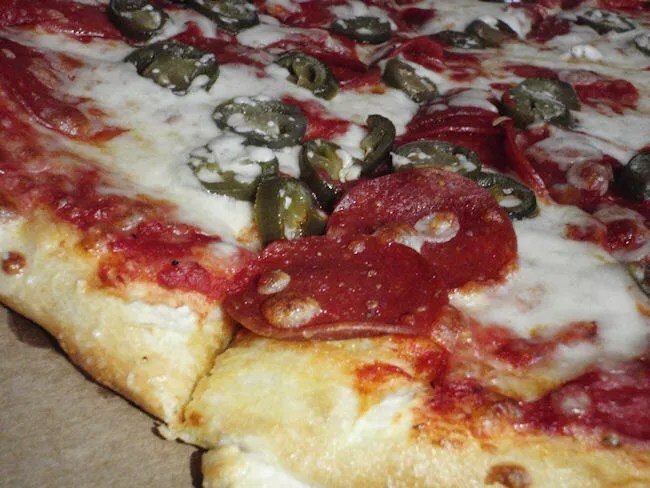 It was topped with a pretty healthy supply of jalapenos and crispy slices of pepperoni. The crust was a little chewy towards the middle, but had a pretty solid crunch on the handle. The jalapenos added quite a bit of spice which drowned out most of the other flavors, but that’s alright…what I could taste was delicious. Vito’s Pizza is another solid Grand Rapids pizza joint. Just because it’s so far from where I work, I probably wouldn’t have ordered from them, but the added publicity caught my attention. 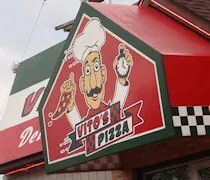 Vito’s Pizza is pretty good I suggest to give them a try you most likely will enjoy their pizza.